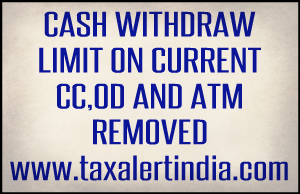 Reserve Bank of India removed all limits on cash withdrawl from current account, cash credit account and overdraft account with immediate effect wheras on ATMs the limit will be removed from February 1. RBI issued note on 30 January 2017 regarding removal of limit of cash withdraw. Full note is as under.